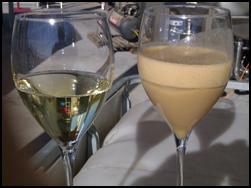 Introducing the new Rocket M7 and M7+7 Automatic Juice and Wine Filter! This filter is so revolutionary, it has been granted a Patent. The Rocket M7 and M7+7 is ideal and affordable for small and medium size wineries. The filters ROCKET are managed by a programmable logic controller (PLC), equipped with operator touch screen panel for setting and display of process parameters, for a semi-automatic control of the machine. The filter does not require personnel present during the filtration step, the operator must be present during all stages of washing when it is required to insert the detergent (soda / acid). No need of product monitoring, if the product treated finish, the machine stops and indicates the fault. Flow control trough a magnetic flow meter, if the value of flow rate are below a predetermined threshold set, the machine stops automatically and indicates the fault. Control speed of rotation of the filter pack via variable frequency drive (inverter), depending on the speed set fixed by the operator. Control of the electric input (Ampere) of the rotation motor to determine the threshold beyond which the filter has reached the maximum density permissible in to the bell. Checking the presence of water for rinsing. Detecting the pressure of compressed air. 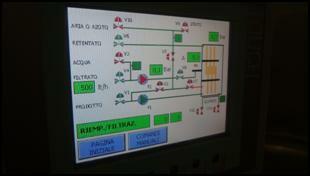 Controls presence of liquid, are installed few levels probes to allow unwinding and correct tracking of the automatic phases. 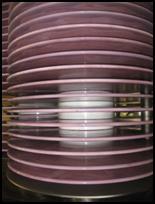 Process filtering through ceramic disks maintaining a low pressure process and constant flow rate. Nominal pore size of 0.2 microns, without use of filter aids such as for example diatomaceous earth. The product to be filtered passes through the filter medium leaving the outer surface of the solid components to be retained, the permeated liquid within the disks is conveyed through a central manifold. The filter disks are maintained in constant rotation to allow a self-cleaning of the outer surface of the discs themselves, in this way is guaranteed a filtration flow rate constant and long lasting. It 'also provided a countercurrent washing (back-wash) with the same product filtered, always to keep clean the filter surface. The ceramic filter ROCKET M7 & M7+7 are suitable for filtering products such as clarification of juice, must or wine lees flotation, filtration residues by tangential filter ... It does not cause any heating or denaturation of the product, loss of color or alcohol, thanks to a filtering process at low pressure and to a filtering stabilized surface. Low power consumption, compact size, and ease of use and complete autonomy in the process. Through a synoptic chart is simple and intuitive to verify the current phase and the process parameters such as pressure, electric absorption rotation and flow of the filtered liquid. ROCKET filter is made on a stainless steel frame, on wheels, containing bell in AISI 304 stainless steel, electric box, series of pumps / motors and servo valves, as described below. 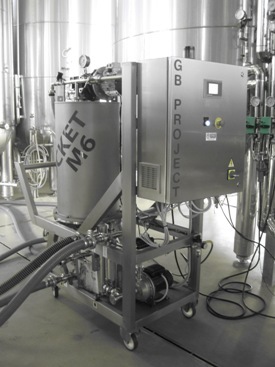 The feeding pump, volumetric type self-priming, sends the product to be filtered into the bell of filtration where it is contained a series of filter disks installed on shaft / rotating collector. A part of the treated product is recirculated to the feed tank. The pump is equipped with stainless steel pre-filter to protect the filter disks from any foreign matter contained in the product to be treated. The shaft is held in rotation by a motor with electronic frequency driver (inverter), is constantly monitored the power consumption of the engine to proceed with locking the process once it reaches the maximum density allowed in the bell of the product, about 75 % vol. / vol. To lengthen the filtration cycle and maintain a flow rate as constant as possible, during the entire cycle there is a step of countercurrent flow called back-wash which allows to have a short flow contrary, for a few seconds, so as to detach the membrane of solids that will form on the surface of the disks. The back-wash is performed, via a centrifugal pump, at intervals during the filtration phase constants based on the times programmed by the operator and related to the level of turbidity of the product to be treated. 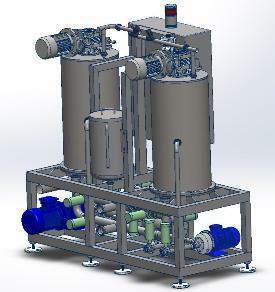 During the filtration stage, in the case rotation motor reach the absorption threshold set or there is a lack of product the machine proceeds to perform a phase of solids discharge and rinsing with water in such a way as to leave the clean filter disks. Will then remain in standby waiting for the operator to proceed with any other phase. The chemical cleaning of the machine is instead performed with a sanitizing solution prepared by the operator to a tank (tank not supplied). Both pumps are used in this phase, feed pump for washing in normal current and back-wash pump for washing in a counter current. The step is executed for a predetermined time by the operator. 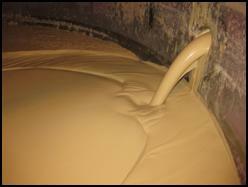 In the same way a neutralization step is performed using a neutralizing solution prepared by the operator. The table below lists the raw juice recovered per ton of white grapes based on an average of 600 liters per ton for this comparison. After cold settling and racking, the remaining gross lees are filtered through the Rocket M7 series. 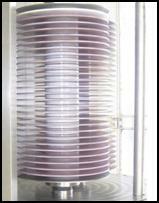 Years needed to recover cost of filter based on net price per bottle over recovered juice from filter / ton.